The story of the Festiniog Railway begins in the reign of King William IV, rises to a bright zenith as Queen Victoria's reign matures and enjoys a comfortable prosperity during the Edwardian period. This position is shattered, along with so much else, by the effects of the Great War, after which begins a steady decline, culminating in closure immediately after the second world conflict. Fortunately, the legacy of Victorian fame and prosperity, together with memories of the railway in the period between the Wars ensured that the railway retained sufficient allure to provoke interest in its preservation, after the second war. The venture succeeded and the Festiniog flourishes today as one of Britain's premier heritage railways, having regained some of its former reputation for excellence and innovation. In the latter part of the 18th century good quality slate had been discovered in the hills to the north west of the village of Ffestiniog, near the headwaters of the Afon Drwyryd, by the time W.A.Madocks, an inveterate 'improver' and MP for Boston, in Lincolnshire, bought an estate on the western shore of the Traeth Bach, the tidal estuary of the Afon Glaslyn. Madocks' aim was to improve its poor agricultural ground. By building an embankment Madocks was able to exclude the tidal waters from an area of salt marsh on the edge of the estuary and reclaim it for rough grazing. Encouraged by this modest success Madocks conceived his grand plan, to build an embankment, a dam, across the mouth of the Traeth Mawr to exclude the sea in order that the land could be reclaimed for improvement. After some Parliamentary battles an Act was obtained and the scheme began in 1807. The Cob, as the embankment became known, was finally completed in 1811. At its western end sluice gates allowed the Afon Glaslyn to flow out as the tide ebbed and held back the tide as it flowed; the force of the river, when released, scoured out a channel that enabled the establishment of a harbour, authorised by an Act of Parliament in 1821, deep enough for ocean-going vessels. Inevitably this, and the town that grew up around it, became known as Port Madock (later Portmadoc and now Porthmadog). During the same period the slate quarries and mines at Blaenau Ffestiniog were being developed, with their products being sent ever further afield once a punitive duty on the sea-borne carriage of slate had been repealed. Overland transport was impractical, so the route from the quarries involved pack animals or carts, over rough tracks, to the shores of the tidal Afon Drwyryd and thence by small, flat-bottomed, boats to ocean-going ships lying at an unsheltered anchorage in the mouth of the combined estuaries of the Drwyryd and Glaslyn. The vagaries of weather and tides made this an unsatisfactory and sometimes dangerous arrangement. The harbour at Portmadoc was a welcome improvement for the final transhipment but, the earlier stages of the journey for finished slates were still slow and expensive. Madocks had aspired to a 'railroad' to connect the quarries with his harbour since 1820 but, the construction of the Cob had bankrupted him. Several schemes were proposed but it was not until 1829, when quarry proprietor Samuel Holland fell in with a young Dubliner, Henry Archer, that the prospect of a railway became a reality. Archer was looking for a scheme to invest in and Holland persuaded him of the benefits of a railroad to carry slates from his and other quarries nearby, to the harbour at Portmadoc. Archer pursued the idea energetically, raising the majority of the money required in Dublin, beginning the process for obtaining the Act of Parliament required for the powers to build a railway and engaging James Spooner, a surveyor trained by the Ordnance Survey, to plan a route for the proposed line. The gauge chosen was 'two feet', the same as already in use in the quarries and, from the outset it was planned to exploit the 700ft. difference in altitude between the quarries at Ffestiniog and the harbour at Portmadoc so that loaded trucks would run down under gravity. The narrow gauge allowed Spooner to plan a sinuous course, following the contours along the side of the valley of the Drwyryd and falling at a steady rate along its 13 mile route. Construction began in early 1833 with Archer as Managing Director, Spooner as Engineer and a contractor engaged to do the work. As so often happened in those pioneering days of railway construction, the early estimates did not match the actual costs and, eventually, the contractor was dismissed and work was completed by directly employed labour, under Spooner's direction. The railway opened for traffic in 1836, but not quite as Spooner had planned it. To maintain the gradient through a shoulder of Moelwyn Bach, Spooner had planned a tunnel but, to save money, the line was opened with a pair of inclines to carry the line over the obstruction. Archer approved of these but Spooner did not, recognising that they would be expensive to work and become a bottleneck as traffic developed; he pressed for the tunnel to be built. The Board supported Spooner, Archer resigned, and Spooner became the Manager. The tunnel was opened in 1842 and, following initial resistance from some quarry proprietors, the Festiniog Railway began to prosper. Loaded waggons (sic) rolled effortlessly down to the harbour under gravity and were returned up the line, in trains of about a dozen at a time, by horses. The horses returned down each section of line at the rear of the gravity trains, riding in special waggons known as Dandies. For the next twenty years James Spooner, assisted by his sons, who had trained as civil or mechanical engineers, pursued a policy of steady improvements in all aspects of the railway. The rather cheaply built formation was improved by strengthening embankments and easing curves and the early forms of permanent way were upgraded, cast-iron giving way to wrought-iron and later to rolled steel rails, in line with contemporary practice elsewhere and with gradual increases in the weights of materials. From the outset the FR employed chaired track, initially on stone block sleepers but, eventually in materials that, to all intents and purposes were the miniature equivalents contemporary of mainline practice. James Spooner was an astute manager; it was his decision that the railway should provide the quarries with the waggons required to send their traffic over the line and to balance their inclines within the quarries, an arrangement that kept them in thrall to the railway and gave the FR a virtual monopoly of their traffic for nearly a century. These waggons were built both by contractors and in the railway's own workshops at Boston Lodge, at the opposite end of the Cob to Portmadoc, established in a quarry from which stone for the Cob had been obtained. The improvements that Spooner made were driven both by the need to keep the railway fit for slate traffic that increased at an extraordinary rate and because he hoped to introduce steam locomotives, in order to convert his mineral tramway into a public, passenger carrying, railway. By the time he died in 1856 the FR was almost ready to fulfil his ambition. Charles Easton Spooner, James' second son, had worked as his father's assistant in all aspects of the development and management of the FR and his appointment to succeed his father allowed him to energetically pursue the same policies of improvement. By the 1860s slate traffic had grown to such an extent that the horse and gravity working was at the limit of its capacity; the horses could not haul long enough trains to return sufficient waggons to the quarries and the provision of extra passing loops, to enable more trains to be run, would have been an expensive and inadequate solution. The answer was clearly steam locomotives, but very few had been built to run on gauges as narrow as that used by the FR. Invitations to tender designs were, however, answered by almost all the established firms, though some designs were quite extraordinary, even by contemporary standards. Eventually a contract for the construction of three small, four-coupled, tank engines was made with George England & Co. of London, one of the few firms not to have responded in the first instance! The decision was heavily influenced by the appointment of Charles Holland, nephew of the railway's principal customer, Samuel Holland, as a consultant in the process of designing and acquiring locomotives and by Charles Holland being otherwise employed in London at the same time. 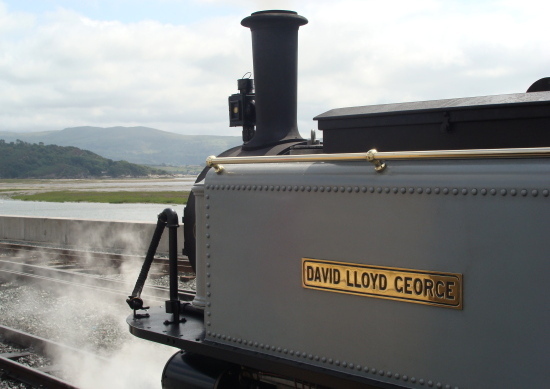 England's design, influenced by Holland, was simple and robust and the first pair of locomotives, named Mountaineer and The Princess, was delivered to Portmadoc in July 1863. They proved disappointing, as the boilers had no domes; England had wanted to fit them but had been overruled by Holland. After negotiating the construction of a fourth locomotive England sent his men to fit domes to the first pair and delivered the second pair, named The Prince and Palmerston, with domes, in early 1864 and they were set to work without problems. With the locomotives in use the railway was ready for the next stage of the Spooners' plan to transform the line, the establishment of a public passenger service. However, there were some obstacles to be overcome, not the least of which was the prevailing legislation that forbade the building of any railway for public passenger services to a gauge less than standard (4ft 8½ins). (The contemporary argument was between the merits of Brunel's broad gauge and the Stephenson's narrow (standard) gauge.) Nonetheless, the Festiniog applied for approval to carry passengers and the Board of Trade sent Captain Henry Tyler to inspect the line. Tyler's report was generally favourable, the narrow cuttings made him recommend that carriage doors be locked, a practice that continues to this day and, almost as a footnote, he suggested that bogie carriages might suit a line with so many sharp curves. Most significant, however, was Tyler's elegant solution to the question of gauge. Recognising that the FR had been built long before the restrictive legislation he decided that, as the railway was not going to be built to carry passengers as it already existed, the legislation did not apply, so he was free to recommend approval for passenger traffic! The FR commenced its public passenger service in 1865, though the quarry proprietors were not enthusiastic. They believed that passenger trains would reduce the line's capacity for their slate and, they had a point. Within four years the FR was applying for an Act of Parliament to authorise doubling of the line to increase capacity in the face of ever greater slate traffic. As before, this would have been an extremely expensive undertaking but, the existing locomotives were at the limit of their capabilities when returning empty waggons to Blaenau Ffestiniog. Loaded trains were not a problem as they still ran under gravity, even passenger trains! Fortunately, a solution was at hand, in the form of Robert Francis Fairlie and his Patent, double-boiler, double-bogie, locomotive. Looking for all the world like a pair of small locomotives joined back to back, but with the wheels and cylinders mounted in swivelling bogies, the Fairlie's Patent double engine had the advantage of delivering a great deal of power while still being able to work around sharp curves; precisely what the FR required. The aptly named Little Wonder was built at George England's factory and put to work on the FR in 1869, with immediate benefits. Slate traffic continued to grow and the railway was able to pay dividends of 7.5%, per half year, a return quite unheard of on railway stocks and one which gave the railway the capital to improve itself still further, even to the extent that one contemporary observer described it as being 'like a main line in miniature'. These results caused the FR to feature regularly in the contemporary technical press where its example was often held up as being the one to follow wherever railways had to be built in difficult terrain or on limited budgets; precisely the conditions that applied in many of Britain's rapidly developing colonies and in other countries just getting to grips with the railway age. Captain Tyler had made these points, as part of his 1865 report and, subsequently, in addresses to technical institutions. In 1870 Spooner and Fairlie arranged a series of trials, pitting the Little Wonder against other FR locomotives. Invitations were sent to all the great and the good in the world of railways with the result that the trials were attended by delegates from colonial and foreign powers, including Scandinavia and Russia and the technical press. The trials provided an emphatic demonstration of the value of an articulated locomotive on a narrow gauge line such as the Festiniog and demonstrated the manner in which a narrow gauge railway was able to carry substantial traffic across difficult terrain while being built at relatively low cost. The reports of these trials, fanned by Tyler, Fairlie and Spooner, eloquent advocates of their parts in the enterprise, established the Festiniog Railway's fame. Fairlie and Spooner promoted the double engine and the narrow gauge respectively, publishing books and articles arguing their points of view on railway development while Tyler promoted colonial development. The Festiniog was, genuinely, at the forefront of some developments. Following the success of the bogie double engine, in 1872 the FR was amongst the first railways in the world to put iron-framed bogie carriages into service, as Captain Tyler had suggested in his report of 1865. Such was the enthusiasm for the narrow gauge in the 1870s that a grand scheme was developed to serve much of North Wales with a network of 2ft gauge lines built on the pattern of the Festiniog. Charles Easton Spooner was heavily involved and his eldest son, Charles Edwin, served as engineer during construction. Fairlie also had a hand in the scheme, persuading the promoters to sign an agreement to use only locomotives built to his Patent; they bought two single Fairlies. Known as the North Wales Narrow Gauge Railways the only parts of the scheme to be completed were a line from Dinas, near Caernarfon, to quarries near Bryngwyn on the slopes of Moel Tryfan and a line, joining this one, which reached other quarries and a remote hamlet at Rhyd Ddu, under the western slopes of Snowdon. The quarries operated sporadically and the line spent much of its life in the hands of receivers. By the time of the Great War it was all but derelict, running only occasional goods services. This railway will feature again in the history of the FR. In the late 1870s the Festiniog faced its first threat from the standard gauge railways. The London & North Western Railway approached Blaenau from the west, via a long tunnel from the Conwy valley, and the Great Western Railway approached from the east via a branch from Bala that would eventually absorb and convert the narrow gauge Festiniog & Blaenau Railway, an independent, narrow gauge, railway between the two eponymous villages that actually functioned as a branch of the FR, in spite of having been built to compete with it. The LNWR hoped to take some of the lucrative slate traffic but was undermined by the Festiniog's practice of providing waggons directly into the quarries and reductions in rates that kept the narrow gauge competitive. The GWR's route to the inland markets was long, so their influence was reduced. Another line, the Cambrian Railways, had initially threatened a branch to Blaenau from their line along the coast but a more co-operative relationship with the FR was developed and an extensive exchange yard for the transfer of slate and incoming goods was laid out at Minffordd in 1872. The FR continued to prosper under Spooner's management, assisted by his son George Percival who had trained as a mechanical engineer. A second double Fairlie locomotive, largely designed by George Percy and named James Spooner for his grandfather, was built in 1872 by Avonside, followed by a single Fairlie from the Vulcan Foundry, named Taliesin, in 1876, together with several more passenger carriages. In 1878 the decision was taken to erect a third double engine, to Percy's design, in the railway's own workshops at Boston Lodge, using parts obtained from several outside sources; Merddin Emrys emerged in 1879 and was followed by Livingston Thompson in 1886, though Percy had gone to the far East just after Merddin Emrys was finished. Charles Easton Spooner died in 1889 and, from then on, the Festiniog was never quite the same. The family connection was broken and his successors had to cope with a gradual decline in the slate trade, though there was a small boom around the turn of the century when a prolonged strike and lockout at Penrhyn Quarry, near Bangor and then the largest in the world, severely restricted the supplies of Welsh slate. During the Edwardian period the slow decline of slate traffic was, to an extent, offset by the rising practice of tourism. The benefits of a journey over the line to enjoy some of the best scenery in North Wales, to take the 'Toy Train thru' Faeryland' as one leaflet put it, were enjoyed by many and the railway benefited. The outbreak of war in August 1914 saw all railways taken under Government control. Parts of Boston Lodge were turned over to the manufacture of components for artillery shells and, though the trains still ran, maintenance was cut to a minimum. Large numbers of men from the slate quarries either volunteered or were conscripted to join the Forces and output fell as a result. Many never returned and the industry never recovered its former strength after the War. The railway, too, had been left in a parlous state as a result of the reduced maintenance and Government control of income. After the Great War the FR relied upon the summer tourist traffic for revenue to a much greater extent, although slate traffic continued. In the 1920s, as part of a scheme to relieve unemployment in the area, a new railway, to be known as the Welsh Highland, was built to connect the former NWNGRys at Rhyd Ddu with the Festiniog at Portmadoc. This new line ran through some spectacular scenery around Beddgelert and should have been a great success with tourists. Unfortunately the rise of motor transport took some potential traffic and a chronic lack of resources made services infrequent and unreliable, in spite of the FR working some of the traffic. As the post-War slump deepened into Depression both railways struggled with ageing stock and insufficient revenue to afford the repairs required. The FR took a lease on the WHR, but still failed to make it pay; the drain came close to bankrupting the FR, until it could repudiate the lease in 1936, when the WHR was closed. The FR continued to operate until the outbreak of the second war in 1939, when passenger services were suspended. Slate traffic, once again greatly reduced by the loss of men from the quarries, was carried throughout the War with trains running three days a week, or as required, until the beginning of the quarries' annual holiday in August 1946 when, literally overnight, the Festiniog Railway closed, one hundred and ten years after it had opened. Attempts to revive the Festiniog Railway began soon after it closed, but none succeeded until 1954 when Alan Pegler, bankrolled by his father and supported by the recently established Ffestiniog Railway Society, obtained control of majority shareholdings in the Company. The Company was woefully short of money and relied upon volunteers from the Society for labour and donations of materials. Work to restore the line began at Harbour Station and Boston Lodge and a brief summer season of trains between the two ends of the Cob was run during July and August 1955. For the 1956 season they ran as far as Minffordd and in 1957, following the installation of a loop, the terminus was Penrhyn. Between Penrhyn and Tan-y-bwlch a great deal of vegetation had to be cleared from the course of the line, but this was achieved in time for train services to be extended to Tan-y-bwlch for 1958. Prince had been the first steam locomotive restored, in 1955, followed by double Fairlie Taliesin (formerly Livingston Thompson), in 1956. Bogie carriages were also restored as swiftly as possible but, in the manner of the early slate traffic, passenger numbers increased at a greater rate than vehicles to accommodate them and the strain was already being felt. 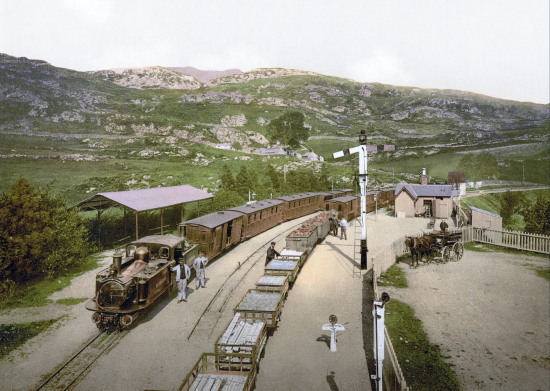 There was also a substantial obstacle to be overcome if the railway was to regain its upper terminus in Blaenau Ffestiniog, as the new owners always intended. Just as the new administration had taken control of the railway, a section of line from just above the Moelwyn tunnel to Tanygrisiau, a village on the outskirts of Blaenau, had been compulsorily purchased to enable the construction of a pumped storage hydro-electric power station and the route to Blaenau Ffestiniog had been blocked. After much deliberation the company resolved to stick to their original intention to return to Blaenau, but were faced with the question of how to get around the large lake that had been put in their way, and how to obtain compensation for the severance of the line. While those answers were sought, the line from Porthmadog to Tan-y-bwlch was improved and more locomotives and rolling stock were restored. Fortunately, traffic continued to grow as more and more families took their holidays in North Wales. The railway was the subject of a live television broadcast by the BBC in July 1960, echoing the Spooner/Fairlie publicity of the 1870s, and this generated huge traffic during that and the following season. Fortunately Merddin Emrys was finally returned to traffic in 1961, relieving the strain on Taliesin, which had required a great deal of attention to keep it running. The two double engines began to show signs of their age early in 1962 and the railway was fortunate to be able to obtain Linda, a large 0-4-0 saddle tank locomotive, from the nearby Penrhyn Quarry railway to ease the strain. Her sister, Blanche, was acquired the following year and both have since given sterling service. Several schemes to avoid the flooded line above the tunnel had been proposed over the years and, in 1963, a proposal to build a spiral, a unique feature for a UK railway, around the station at Dduallt was considered by the Board and approved. Work was to be done, as far as possible, by volunteers and it was not to detract from volunteer efforts on the section of the line already open. At the same time the Board considered the prospects of reopening the section of line between Tan-y-bwlch and Dduallt and commencing a programme of building brand new carriages to increase capacity; both were approved. The first sod was turned on the Deviation, as the new line between Dduallt and Tanygrisiau became known, in January 1965 and, later in the year No.24, the first new carriage was put into service; it was later renumbered 100, to celebrate the FR's centenary of passenger traffic. Dduallt became the new upper terminus when services were restored in April 1968, but only after the national outbreak of foot and mouth disease had made opening very uncertain by severely curtailing volunteer work. The station, an idyllic and isolated spot, was now the centre, almost literally, of the civil engineering work for the spiral that allowed the railway to get through the same shoulder of Moelwyn that necessitated the former tunnel with sufficient height to emerge above the level of the power station's lower lake. A new tunnel was driven by a team of Cornish miners and, following delays to deal with loose rock inside, the railway was opened to a temporary station at Llyn Ystradau, in June 1977. The Deviation was formally completed in June 1978, when a new station on a slightly altered alignment was opened at Tanygrisiau. The old alignment was regained just beyond the Blaenau end of the station. The Deviation had involved countless hours of volunteers' work over more than a dozen years. In the early days it operated on a shoestring but after the tunnel was complete it benefited enormously from a variety of grants and job creation schemes. It took a further four years to refurbish the section of old line from Tanygrisiau to another new station in Blaenau Ffestiniog (all the old sites were inaccessible or had been built over). The limitation was money as the Company had spent a great deal on the Deviation, in spite of receiving compensation from the Electricity Authority. Completion of the railway back to Blaenau Ffestiniog was marked with a ceremony on 25th May 1982, one hundred and fifty years since the original Act of Parliament received Royal approval and just less than thirty years since restoration had begun. While the line was being rebuilt the FR had built itself a brand new double Fairlie, Earl of Merioneth of 1979, rebuilt its original locomotives Prince & Merddin Emrys, several times, acquired Linda, Blanche and an ex-WD, American built, 2-6-2 tank engine that had been named Mountaineer, converted its steam locomotives from burning coal to oil, acquired several large diesel tractors and adapted them for passenger services and built a large fleet of modern, corridor, carriages to carry its ever-expanding passenger traffic. All these developments, together with the remarkable achievement of the Deviation had kept the Festiniog Railway in the technical and public press in a manner very reminiscent of its Victorian heyday. Since 1982 the FR has continued to develop. Another new Fairlie, David Lloyd George entered traffic in 1992, a replica of the single Fairlie, Taliesin, was completed in 1999, the derelict remains of Palmerston, the fourth England engine of 1864 have been restored and a large, bogie, diesel locomotive, Vale of Ffestiniog, has been put to work. Having given many years of service all the surviving carriages, some dating from the 1860s and 1870s have been extensively, and expensively, restored. Since 1989 the FR has been involved with rebuilding the long-closed Welsh Highland Railway, extending it along the track of a former standard gauge line to a station alongside the castle in Caernarfon. For the Narrow gauge files. An Illustrated History of the Festiniog Railway. Peter Johnson, Oxford Publishing Co, 2007, ISBN 0-860936-03-1. Little Giants: A History of the Ffestiniog Railway's Pre-Revival Locomotives. Chris Jones & Peter Dennis, Lightmoor Press. 2018, ISBN 9781911038436 . North Wales Branch line album. C. C. Green, Ian Allan, 1983. ISBN 07110-1252-0. The Festiniog Railway Vol 1. J.C. Boyd, Oakwood, 2002. ISBN 0 85361 167 X. The Festiniog Railway Vol 2. J.C. Boyd, Oakwood, 2002. ISBN 0 85361 168 8. The Narrow Gauge Railways In South Caernarvonshire Vol 1. J. C. Boyd, Oakwood, 1988. ISBN 085361 365 6. The Narrow Gauge Railways In South Caernarvonshire Vol 2. J. C. Boyd, Oakwood, 1989. ISBN O85361 383 4. Narrow Gauge Railways In North Caernarvonshire Vol 1. The West. J. C. Boyd, Oakwood, 1990. ISBN 085361. Narrow Gauge Railways In North Caernarvonshire Vol 2. The Penrhyn Quarry Railways. J. C. Boyd, Oakwood, 2001. ISBN 0 85361 312 5. Narrow Gauge Railways In North Caernarvonshire Vol 3. The Dinorwic Quarry & Railways etc. J. C. Boyd, Oakwood, 1986. ISBN 0 85361 328 1. Railway Magazine, August 1900. Illustrated Interviews – Mr J. S. Hughes, Festiniog Railway.